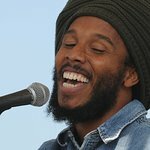 Ziggy Marley – son of Bob Marley – set up URGE, an organization to help children in Jamaica. He once designed a shirt for Fashion Against AIDS, to spread awareness about HIV-AIDS among young people. Marley is an honorary member of the board of directors for Little Kids Rock, an organization that provides free musical instruments and free lessons to children in public schools throughout the United States. Google trends for "Ziggy Marley"
We don't have any videos related to Ziggy Marley.